Riverside Park, a City of Janesville-owned facility, covers 87 acres and runs along the beautiful Rock River. The park features scenic overlooks, picnic areas and pavilions, and boat launches. A full list of features and amenities can be found below. Purchased in 1922, Riverside Park became the city’s centerpiece filled with natural beauty and great recreation. 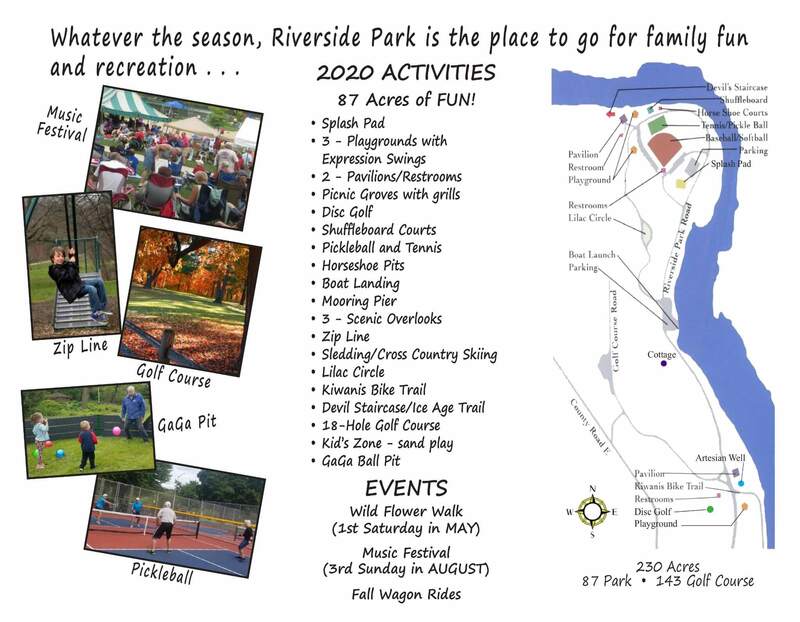 The Friends of Riverside Park, a 501(c)3 non profit organization, was established in 2006 to revitalize and promote Janesville’s historic and scenic Riverside Park. Looking for a community service opportunity, or just interested in giving back while getting some exercise outdoors? Join the Friends of Riverside Park during its next work day. These are held from 9 a.m. to 1 p.m. on the 2nd Tuesday and 4th Saturday, March through November and weather-permitting. The City of Janesville allows groups or individuals to reserve a picnic pavilion or picnic grove for family reunions, picnics, wedding receptions, etc. Riverside Park is 87 acres and runs along the beautiful Rock River, with three scenic overlooks, picnic areas and pavilions, and boat launches.